OK, by now it’s probably pretty safe to say that the bulletin boards are hung, the lessons plans are rolling and Open House is crossed off the list for another year. So take a deep breath and give yourself a high five… I’m sure you’re new school year if off to an awesome start! But don’t get too comfy because now it’s time to take that blank canvas and fill it with some super cool digital learning opportunities that will transform your classroom into a place where students love to learn! So, where should you begin? Well, check out the infographic shown below for some ideas to kick start a brand new technology-based concept in your space! Of course, don’t sweat it if you’ve never heard of these topics. Just Google one or more of them—and you will be amazed at the resources you can locate to make any of these suggestions a reality! Remember, integrating new activities takes time, patience, trial and error, and a good dose of humor! 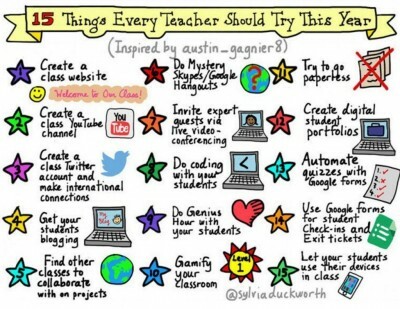 Just find what works best for you and your students, and you’ll have a great year learning new skills together! Thanks to Sylvia Duckworth and Austin Gagnier for combining their talents to create this awesome sketch note!